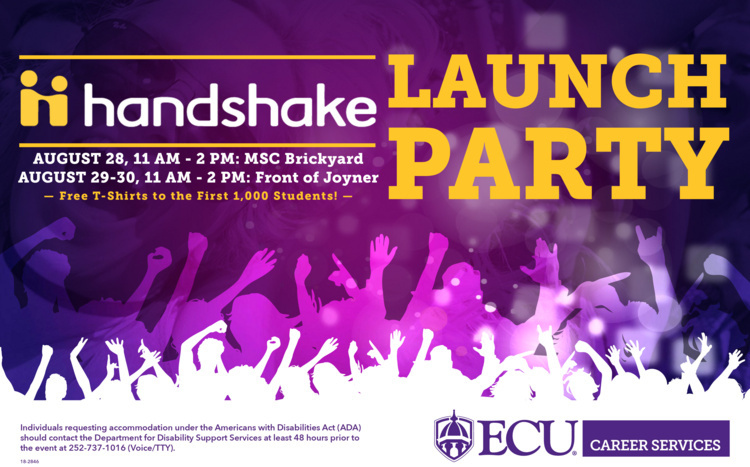 ECU Career Services has a new job posting system and we want students to come celebrate the launch of HANDSHAKE with FREE T-shirts and food! I stopped by to chat with one of the Career Services employees about how receptive students have been to Handshake so far. It was great to find out that the tee-shirts allotted to the first 1,000 students had been given away--and then some (1,200 total). It was also great to hear that the turn out was especially high during the Get a Clue event. Looks like Handshake got off to a great start with Student Pirate Nation! Loved it. Not only was I offered a lot of useful information, but as one of the first 1,000 students to sign up, I received a free tee-shirt. I'll be wearing it tomorrow for the Get a Clue Event. Thank you, Career Service, for providing this opportunity for students of Pirate Nation! It was great! I stopped by at the Handshake Launch Party table that was set up as part of the Get a Clue event. I was wearing the tee-shirt I'd been given during my visit the day before, and my effort to be a "walking billboard" for Launch was recognized. Thank you!